Ex Hot Girl: Calorie Sticker Shock? 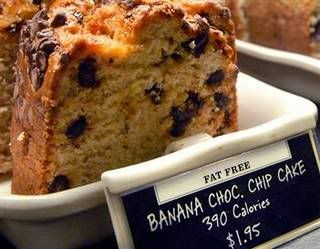 I just found this article (from July 2008) about New York requiring food establishments to post the calories for any food they sell in the same size and font as the price! This is BRILLIANT. Wouldn't you love to be able to see this when you go out someplace? I know I would. Man, I want this in Milwaukee. Tell me what ya think... would you like this where you live? The thing that most amazed me about this article was not the law. It was the part about the woman who ate at TGI Fridays and was all pissed off that they'd done it. (By the way, the fines start at $2000 if these places don't comply.) She saw the menu and that many of the meals were over 2000 calories each, and one of the desserts was 1500 calories. She said, "I wish they wouldn't have done this," and then asked if they had any of the old menus without the calorie count on them! Talk about denial. Seriously? You'd rather eat foods and have no idea how bad they are for you? Or, you know how bad they are for you, but you somehow think you'll feel better just blindly eating these foods without the facts in front of you? That's the most ridiculous thing I've ever heard. We should be HAPPY with this kind of information. Sheesh! So... Anybody reading live in New York? How do you like it? Do you find it helps you stay on track with healthy eating? You really don't know what is in the food you get at some places. 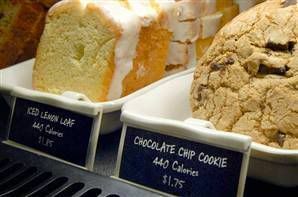 A muffin could cost you 630 calories. When getting your morning coffee, I bet that would keep you from buying it. Everyone has their causes, and they are all worthwhile. When I buy a leather jacket or a pair of boots, I don't want a tag on them reminding me about the way the animals had to die. When I buy a lightbulb, I don't want a tag telling me exactly why I am wasting energy and there is a better bulb I should buy. And I probably should. But I don't. And for me, calories and nutrition information is important. But for someone else, who knows that they are eating something that isn't great, but is ok with that, I can see why being hit with it all the time would be annoying. I feel like we have the right to information, and should fight to get it. But I also think we all live in some kind of denial. I just don't know how to balance it. I am more interested in the ingredients of food than the caloric value. And I'm afraid that posting the caloric value will not teach people to make healthier choices... just lower caloric choices, which is most definitely not the same thing! I think the people who watch their calories & are conscious of what they eat will appreciate this, BUT people who don't care (like the woman asking for an old menu) and won't notice/disregard the information. I'm from Boston and I've seen it and it definitely stops me from thinking twice about getting something. Gosh, I would hate having the calories blasted on the front. It would either keep me from buying a spontaneous treat, or if I did buy it, I'd be thinking about the calories the entire time vs/ what a nice snack I was having. I think calorie info IS inportant, but I say leave it on the back with the other information. Very thought provoking...When I see news shows that feature segments that reveal the calorie counts of favorite foods, it shocks me and makes me think twice about eating that certain item. But I can see how some people would be bothered by having that information in their face (so to speak) all the time. I have wondered as well...about what NYC'ers think of the cal count being there. Im in the crowd who would rather not know I think :) I KNOW when Im making decadent choices----and I dont want those treats ruined by #s.
cant wait to see what other people say! The first is that often the calorie count of a food is not its most pertinent aspect in regards to your health. I think that depending solely on calories is a risky oversimplification of ones intake. Nutritious eating is more than just calorie counting (as we know quite well from your previous posts). The second problem I have comes from my libertarian politics. I dislike the idea of legally mandated business practices, even where they have the public's "best interest" in mind. This may prove detrimental to business owners. Wherever the government introduces legislation that forces, rather than encourages, healthy behavior, I see it as a boundary violated. A more amenable solution would have been to have the calories AVAILABLE for perusal by customers, rather than posted in the name-plate. I vote no on this practice. I can watch my own health, I count more than just calories, and the government has no business in business practice. Boo in general. As I travel to New York often, I have seen the caloric counts. While I do agree that there is so much more to know about the nutritional information than the caloric count, I do find it a nice reminder that something that may appear to be a serving really isn't. I do wish there was more about the actual ingredients so we were even more informed. Fortunately, most places have this information on websites now and it helps to review this before going out. Love your blog already! And as a dietetics major i can appreciate the benefit of having information about kcals and fat content at your finger tips. However, must say, i'm a little hesitant about this one... it could possibly lower the quality of your one fancy birthday dinner a year, ya know? Chef's would be required to go buy exact measurements at all times. I have a good amount of experience around fine dining chef's in my family, and none of them measure anything. It could require compromising some quality. People should try harder to educate themselves!